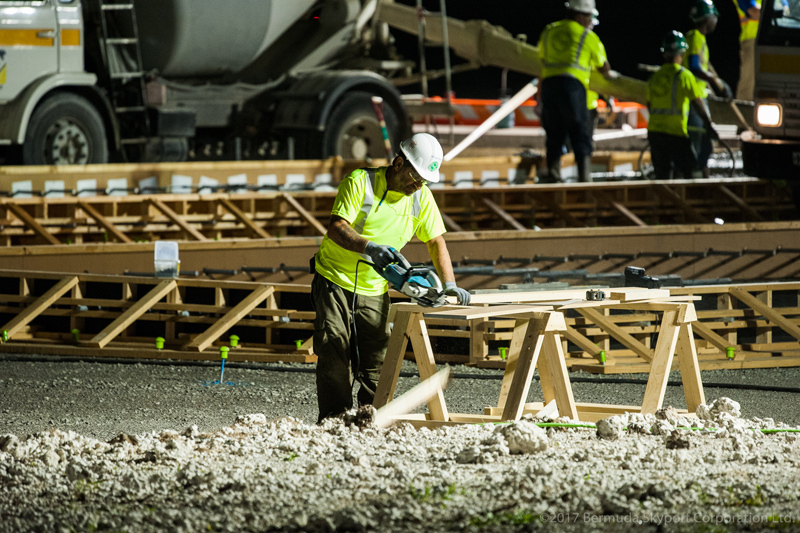 [Updated with video] After months of excavation to prepare the base of Bermuda’s new passenger terminal, concrete has been poured to develop the first new taxiway at the LF Wade International Airport in 15 years. 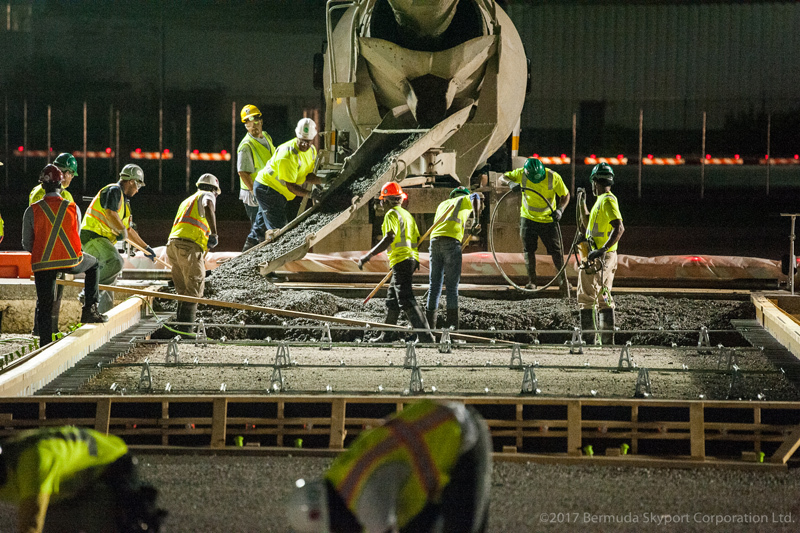 On Tuesday at 9pm, concrete was poured for Taxiway W, which will replace the existing Taxiway S as the second pathway in and out of the terminal parking area. Taxiway S will permanently close due to the construction of the new terminal. The construction crew will pour approximately 80 cubic metres nightly until the project is completed. 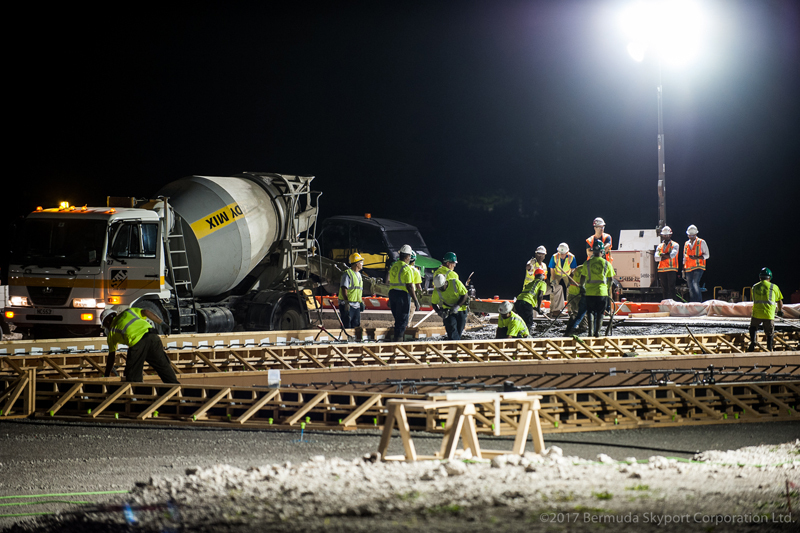 The work will be done at night to minimise impact to aircraft arrivals and departures. 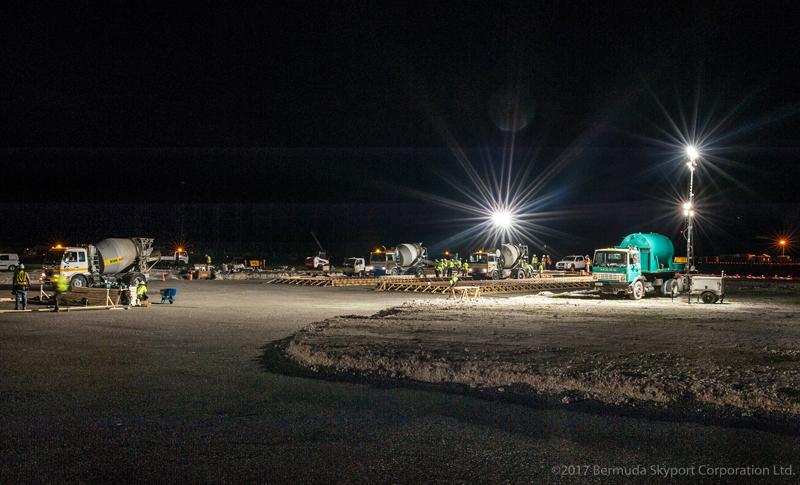 Work began on the new taxiway on June 7 and is expected to be completed mid-September. The new taxiway must be ready for operation before Taxiway S can permanently close. The construction phase of the Airport Redevelopment Project is expected to take 40 months and be completed in the summer of 2020. “The redevelopment of LF Wade International Airport is being implemented under a Government-to-Government framework agreement between the Governments of Canada and Bermuda,” the company said. “In terms of the agreement, Bermuda Skyport Corporation Limited will oversee the overall development and implementation of the project, and the Canadian Commercial Corporation [CCC], through a subcontract to Aecon, will deliver the construction component of the project. That looks like a lot of Canadians those are jobs unemployed Bermudians can do immigration minister you better sort this out! As normal u talk out your wrong hole. I work there and am a Bermudian, but not one Canadian on that night crew..get your facts correct..
Nice to see Bermudians employed. Nights are a beach but they are paid well and sleep good. wot?..de plp aint put a stop to dis??? I totally agree real onion. It was a bad I’ll conceived deal. Not a good deal for Bermuda. The PLP needs to stop this first and the review this deal. Yeah maybe it was a bad deal!! But it is a done deal now..Unless Burt can pull a rabbit from his a.. and find the millions to pay if he breaks this deal.. I can remember a few years ago when COH was going to lease the waterfront for 262 years.. or spending millions of over runs by the former PLP gov..Mr Burt and his suporters talk about the old guard of the ubp in oba but remember he has 3 former ubp mps now in his party..Polotricks at its best..P.S now that that Burch is back in gov how about he start cleaning up his mess with the 4 men he brought in under darkness and finding them a legal passport and a right to travel..
Bull s@!te! This is a great deal for BDA! Cancel the contract and pay the penalty…..second couldn’t ask for more…..fulfillimg contract without lifting a finger……then we ((Bermudian a and guest workers) will have to pay double for the completion of the airport……with money we do NOT have. How ignorant can we f@&cking get? does anyone know if the new airport will have a starbucks I love their coffee? They could serve onion juice. Shhh Real Onion, don’t speak to soon!!! How can the PLP justify going ahead with this project?